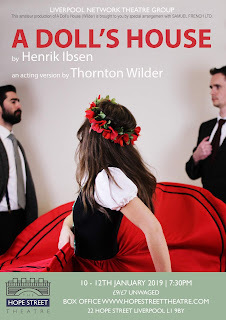 NUMBER 9: Theatre, Music and Film: REVIEW: A Doll's House - Hope Street Theatre, Liverpool. REVIEW: A Doll's House - Hope Street Theatre, Liverpool. Lights up on an empty stage, a curious audience lay in wait - studying the set in front of them. It is Christmas, a bright fuschia tree sits upstage right, while two porcelain dolls gaze into your very soul from the dining table in the centre of the stage. We were left long enough to truly take in the set before Nora (Jessica Martin) entered with gifts and bags in tow. Martin’s bold and animated presence is enough for one to entirely forget whatever technical fault had left us waiting. A presence that she kept up throughout the whole performance with the utmost professionalism. It is almost hard to believe this was her first performance for the Liverpool Network Theatre Group. Director Donna M Day has stayed true to the script but brought such a performance forward into a more relatable period through the use of costume. With the play set over three days, the use of garish and interesting Christmas jumpers in Act 2 is a clever touch, and one that manages to keep the audience aware of the time frame. I must commend Alexander Davies during this point, for still managing to hold the ruthless air of Nils Krogstad even while dressed in a jumper that can only be described as something one might be gifted by a terrible sibling. His performance was drawing, and eyes don’t take into account the massive reindeer on his front, nor the three brown spikes down either arm (I can only assume these are supposed to be antlers). Though, I was not at the Hope Street Theatre to review Merseyside Fashion Week, even if the broad range of Christmas attire did give such a thing a hypothetical run for it’s money - especially with Martin in her full Christmas tree dress. Not only do the costumes help, but Day uses set pieces in a beautiful way. With the lack of children in the cast, Day created the illusion of the children through the use of the aforementioned dolls. Somehow, the vocal work of Sarah Jones and Jake Angerer had done wonders, and no longer were these china dolls like something out of Chucky and our worst nightmares, but they were now animated and alive with their own personalities. The Hope Street Theatre is a small space, seating only 130 at its maximum, but the crew did their best with the space and even from the back row at the top it was as if we were sitting in the very house of the Helmers. An intimate space for an intimate play, and it worked. The actors had nowhere to hide and the audience could get away with no interruption. The smallest of coughs could be heard, and even in the winter weather with colds and flu galore, not a single actor on stage lost their sense of character. ‘A Doll’s House’ is a play with a large name to fill and arguably one of Ibsen’s greatest pieces. A story where chemistry is key, it was clear that the cast meshed well and cared for each other. Even multirole parts played by Jones and Angerer were played with gusto and care, to the point where just their expression alone were enough to distinguish when they changed character. Special attention must go to Jones, who managed to portray the playfulness of Nora’s daughter Emmy, but then managed to switch so seamlessly into the roll of the maid Ellen. Her expressions were without fault and her performance did not falter. With a cast of eight, ‘A Doll’s House’ managed to leave the audience laughing at points I thought could never be amusing, and came to a beautiful and clear end. Vicary’s characterisation of Thorwald Helmer truly came into its own in the third and final act. The strong willed and even cold Helmer can be seen to collapse under the weight of his situation, and it is a fitting end to such a character. Nothing is perfect but the Liverpool Network Theatre Group’s rendition of the Wilder version of ‘A Doll’s House’ is ultimately something to be seen. Martin and Davies and truly actors of talent, held up by a beautiful cast. I can forgive the technical faults and the pauses because they happen to the best of us, and the cast truly pulled back from each moment of silence. A satisfying end with a strong second half, the Liverpool Network Theatre Group have given a step for true talent to shine through. Bring on the next performance from this company! REVIEW: Kes - The Playhouse, Leeds. REVIEW: Marilyn - The Casa Theatre, Liverpool. REVIEW: Angels - HOME, Manchester. REVIEW: Cuts Of The Cloth - HOME, Manchester. REVIEW: Swan Lake - Palace Theatre, Manchester. NEWS: Gypsy Queen play announces a third UK tour! REVIEW: Eye For An Eye - HOME, Manchester. REVIEW: Fat Girl Singing - HOME, Manchester. REVIEW: Propel - HOME, Manchester.